Panko tenders and fries with a side of ranch dressing. 10Q Chicken opened at 816 Church St. in late August. Beware all Chicken Shack lovers: there might be a new king of chicken in town. 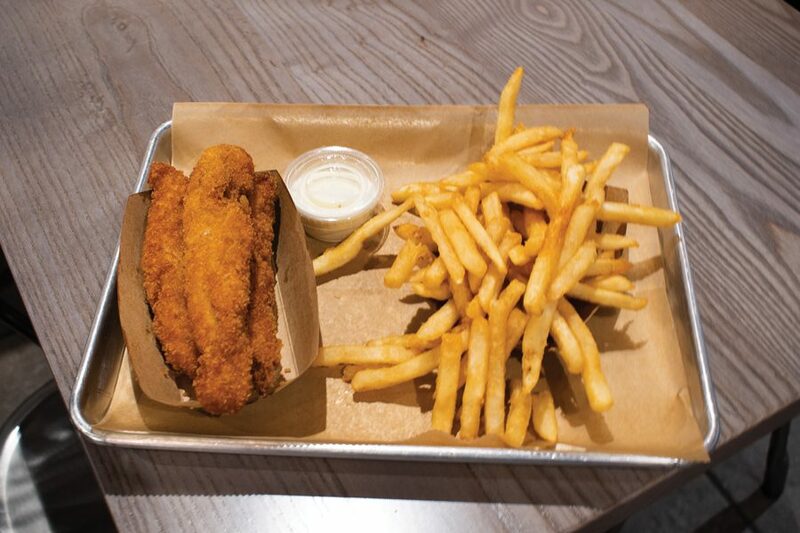 A new restaurant called 10Q Chicken opened in downtown Evanston in late August, offering Northwestern students a new dining option that hosts a selection of chicken-based menu items. David Yoo, who also owns Chicago clothing store Belmont Army, collaborated with Will Song, owner of Chicago-based Korean fast food joint bopNgrill, to create 10Q, combining Yoo’s background in retail with Song’s culinary expertise. Together, the pair developed the 10Q menu over the past year. “We really wanted to do something different and better than your typical fast, casual restaurant,” Yoo said. Nestled between a bank and an investment firm, 10Q is located at 816 Church St., just a few blocks from campus. Yoo said he and Song also looked at potential locations in Hyde Park and Rogers Park for their restaurant, but they ultimately settled on the Evanston spot. Since Northwestern’s academic year began last week, Yoo said he’s noticed a lot of students coming in. The Church Street location formerly housed Five Guys, which closed in December 2016. The site had been vacant for nearly two years before it was filled by 10Q. The menu centers around chicken, featuring items such as the Korean BBQ bowl, Kangnam Style wings and panko-coated chicken tenders. 10Q also offers a Chili Buffalo sandwich — with buffalo drizzle and pickled jalapenos — for those seeking some extra heat. Complete any meal with Bacon Ranch Cheese Fries or Matcha Soft Serve Ice Cream. Yoo said the 10Q sandwich and the Kangnam Style wings are his two favorite dishes, noting that they are also the two most popular menu items. The restaurant is a sleek, modern space, mostly black and white except for a big neon sign reading “10Q Chicken” that hangs on the main wall. According to its website, the name 10Q plays on “thank you,” a simple phrase reflective of the restaurant’s ultimate goal: to serve and please its customers. “Customer service and hospitality; giving customers what they want has always been central,” Yoo said.